A visit to Dark View Falls’ cascading twin waterfalls promises stunning natural beauty and exhilarating outdoor adventure. 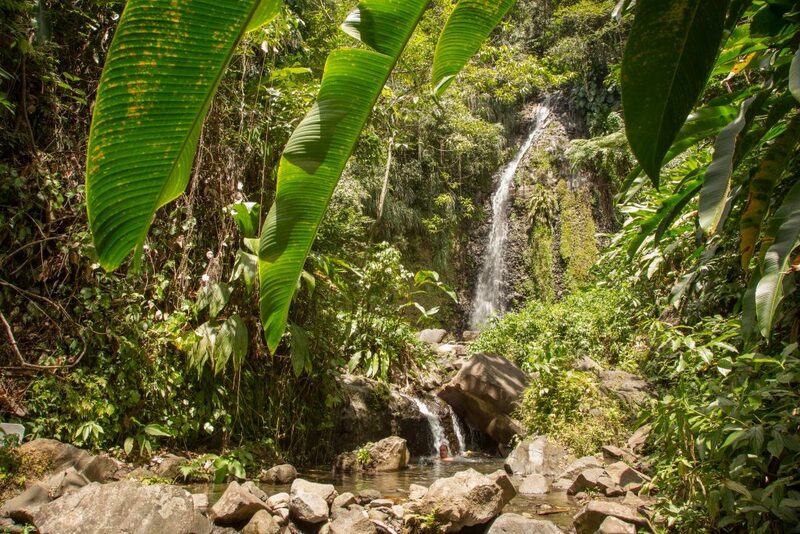 Dark View Falls showcase St. Vincent & The Grenadines’ spectacular unspoiled beauty, with two magnificent waterfalls plunging into pools below. A narrow bamboo bridge leads you over a tumbling river as you hike to the park’s first waterfall. While the bridge offers railings to hold, you’ll likely feel an adrenaline rush during the crossing. On the other side, you’ll soon be rewarded with spectacular sights and relaxation. Cool off with a refreshing swim in the pool beneath the waterfall. Then, the second waterfall is just short 10-15 minute climb away. This one is even grander, at 230 feet. Set aside a few hours to experience all that the Dark View Falls have to offer, including picnicking in the shady groves and swimming in the freshwater pools. The park is open 9 a.m. to 5 p.m., and a small entrance fee is required for entrance. Have you experienced Dark View Falls? Share your experience in a comment below!